Today's guest is a little girl who lived a short life but took up her pen to keep a journal that the Victorians took to their hearts. An intelligent, thoughtful girl with a keen eye for the world around her, it is a pleasure to tell the tale of Marjory Fleming. Marjory was born as the third child of accountant James Fleming and his wife, Isabella Rae. She was a fiercely intelligent child and spent a number of years in Edinburgh with her cousin, Isabella Keith, who undertook the job of educating the little girl. She instilled in her a love of the written word and poetry and Marjory began to pen verses of her own. Fascinated by the world around her, Marjory watched and absorbed all that she saw and from a young age, proved to be a prolific letter writer. In the last years of her short life, she began keeping a diary of her experiences that provides a fascinating insight into the life of a child in the era. Amongst her relatives she could count Walter Scott and rumour has it that he was highly impressed by the poems of the little girl, but her writings were largely ignored for many years after her death until they were rediscovered by Victorian readers who adored highly expurgated versions of the writings of Pet Marjory. 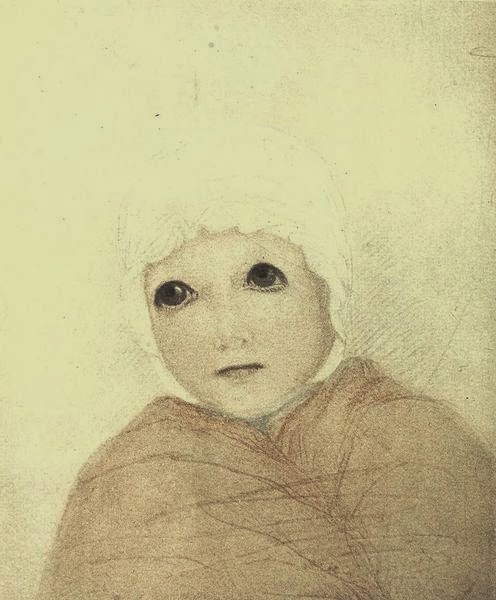 Marjory contracted measles during an epidemic in 1811 and though she appeared to recover, she died of "water on the head" just shy of her ninth birthday. It is now considered that this remarkable child fell victim to meningitis and she was laid to rest in in Abbotshall Kirkyard, Kirkcaldy. Aw - what a sweet little picture and such a sad story.